The RYG™ Golf Academy at RedTail has developed a unique and highly effective instructional philosophy centered on our student's short term and long range goals. We thoughtfully termed our distinct approach to instruction: The G.O.L.F.™ Program. The acronym G.O.L.F.™ stands for Goal Oriented Learning Format. This program encapsulates our belief that golfers are much more likely to lower their scores and improve their game when attempting to achieve tangible milestones and objectives. As such, all lesson experiences at RedTail begin with a Player Profile during which we will establish and understand your specific goals relative to golf. Once these goals are identified precise lesson curriculums, practice regimens and timelines can be established and implemented with clarity and confidence. We further believe that a commitment to continuity throughout your golf instructional experience is critical to success. We do not want to create a series of "band-aids" or disjointed lessons. Rather, we will establish a well-defined and realistic Personal Lesson Plan (PLP) that will detail all aspects of your individual roadmap to playing better golf. As we improve your golf swing, lower your scores and enhance your enjoyment of the game, we will constantly review and analyze your PLP to make sure we are achieving your goals and making progress within the desired timelines. We hope you will give us the opportunity to show you our unique G.O.L.F.™ Instructional Program. We guarantee you will be amazed at how we can lower your scores and enhance your enjoyment of the game! 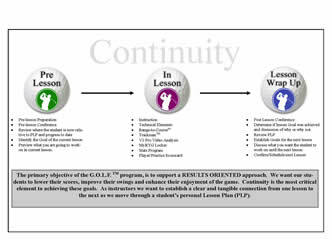 The RYG™ Teaching Triangle and Continuity Diagram shown below are Visual Representations of our G.O.L.F.™ instructional Program. 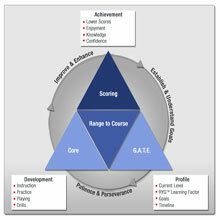 The Personal Lesson Plan (PLP) template shown below details our break down of the three (3) distinct categories of golf instruction: Technical, Range-to-Course and Scoring.